"The investigation team examined all images available and determined that the ‘Buk' unit has a number or unique features," Wilbert Paulissen, head of the Dutch Police's National Crime Squad, said Thursday. "It is determined that the system that shot down the Boeing originated from the 53rd anti-aircraft missile brigade from Kursk in the Russian Federation." The investigation team said it compared dozens of images and came to the conclusion that those "unique features" point towards a Buk missile system owned by a Russian army brigade. However, they have never shared any of those pictures, nor elaborated what "unique features" they were talking about. The investigation also says it suspects some 100 people were involved in the launch preparation, but have never published their names. The investigation team head, the Netherlands' chief prosecutor Fred Westerbeke, said he cannot say who is responsible for this atrocity. Instead, he underscored that the investigation is continuing. "We have a lot of proof and a lot of evidence, but we are not ready yet," said Westerbeke. "There is still a lot of work to do." Another area of extremely muddy waters has to do with the age and model of the missile alleged to have taken down the plane. Curiously enough, H-shaped submunitions typical of the newer 9M38M1 version of the missile were discovered near the crash area — but there are no marks from H-shaped munitions on the plane's fuselage. 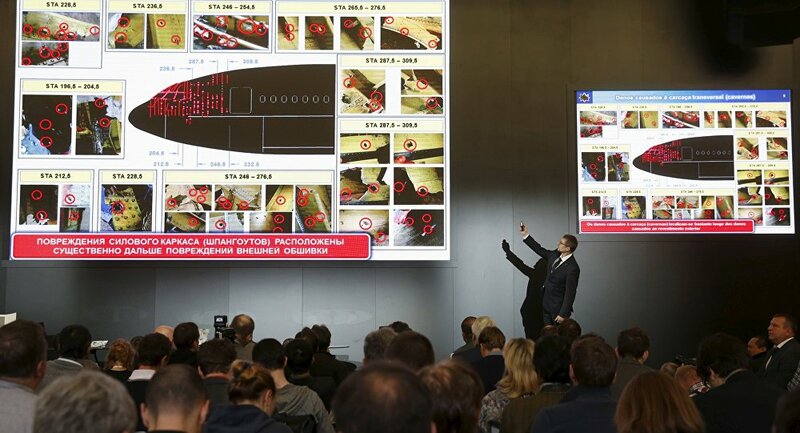 According to Almaz-Antey, which conducted a simulated experiment in October 2015, the holes on MH17's fuselage were made by cube-shaped submunitions, a dead giveaway for the old 9M38 missile. According to Almaz-Antey, the JIT also twisted or ignored of information presented by the company during the investigation, including the report on the test fire experiment — this, despite the fact that technical documentation regarding the 9M38 and its 9M38M1 modification was declassified specifically for this investigation. "We were ready to present both the program and the method of the experiment, but were told ‘thank you very much,' and that was the end of it," Mikhail Malyshevsky, an adviser to the company's head engineer, said in a 2015 interview. According to the JIT's version of the events, a Russian Buk system was covertly transported to Ukrainian territory just before the event. This was previously shown in a documentary published by the team. The film refers to a recording of a phone conversation. On the tape, someone says that a Buk is needed to counteract enemy aviation. The JIT has never said whose voice this is, nor has it provided proof that the tape is genuine, nor has it explained how it proves that the Buk was relocated across the Ukrainian border.